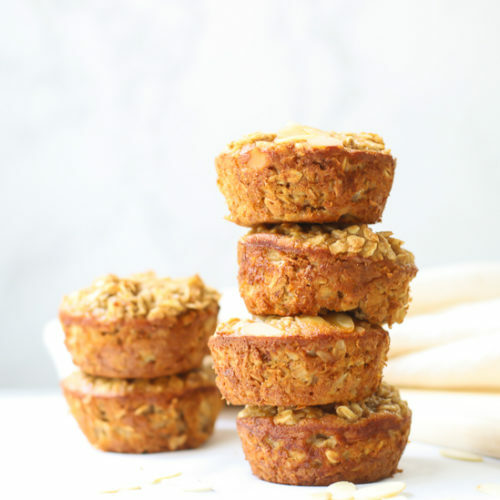 These easy baked oatmeal cups are a quick grab and go breakfast or snack. Add it to your meal prep for a healthy whole grain breakfast! Preheat the oven to 350ºF. Spray or oil a standard 12-well muffin tin and set aside. Mix the wet and dry ingredients in separate bowls. Fold the dry ingredients into the wet just until combined. Spoon the mixture into the muffin pan and top with sliced almonds. Bake 25-30 minutes at 350ºF until golden brown. Cool on a wire rack. Refrigerate or freeze to eat during the week. Reheat in the oven (or toaster oven) about 5 minutes on 350ºF. If frozen, go 15-20 minutes.